“Animal Kaiser Evolution 7 cards list” has been revised. 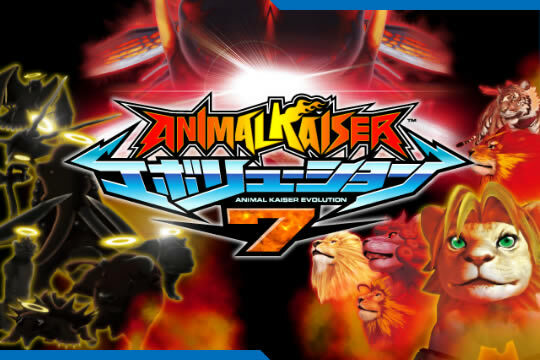 “Animal Kaiser Evolution 7's new additions.” has been revised. “Evo.7 is here at last!” is revealed. “Animal Kaiser Evolution 6 cards list” has been revised. “Animal Kaiser Evolution 6's new additions.” has been revised. “Evo.6 is here at last!” is revealed. “This is your last chance to get the best Evo.5 cards! “Animal Kaiser Evolution 5 cards list” has been revised. “Animal Kaiser Evolution 5's new additions.” has been revised. “Evo.5 is here at last!” is revealed. “This is your last chance to get the best Evo.4 cards! “Animal Kaiser Evolution 4 cards list” has been released. “Animal Kaiser Evolution 4's new additions.” has been released. “Evo.4 is here at last!” is revealed. “This is your last chance to get the best Evo.3 cards! “Animal Kaiser Evolution 3 cards list” has been released. “Animal Kaiser Evolution 3's new additions.” has been released. “Evo.3 is here at last!” is revealed. “This is your last chance to get the best Evo.2 cards! “Animal Kaiser Evolution 2 cards list” has been released. “Animal Kaiser Evolution 2's new additions.” has been released. “Evolution 2 is here at last!” is revealed. “This is your last chance to get the best Evo.1 cards! “Animal Kaiser Evolution Ver.1 cards list” has been released. “Animal Kaiser Evolution Version 1’s new additions.” has been released. “Animal Kaiser Evolution” is here at last! “Ver.6 cards list” has been released. “Version 6’s new additions.” has been released. “Version 6 is here at last!” is revealed. “This is your last chance to get the best Version 5 cards! !” has been released. “Ver.5 cards list” has been released. “Version 5’s new additions.” has been released. “Version 5 is here at last!” is revealed. “This is your last chance to get the best Version 4 cards! !” has been released. “Ver.4 cards list” has been released. “Version 4's new additions.” has been released. “Version 4 is here at last!” is revealed. “This is your last chance to get the best Version 3 cards! !” has been released. “Ver. 3 cards list” has been released. “Version 3's new additions.” has been released. “Version 3 is here at last!” is revealed. “This is your last chance to get the best Versoin 2 cards! !” has been released. “Ver. 2 cards list” has been released. “Version 2’s new additions.” has been released. “This is your last chance to get the best Version 1 cards! !” has been released. “Version 2 is here at last!” is revealed. Animal Kaiser official website launch! Unauthorized transferal of text, pictures,moving images or downloadable files found on this site is prohibited.